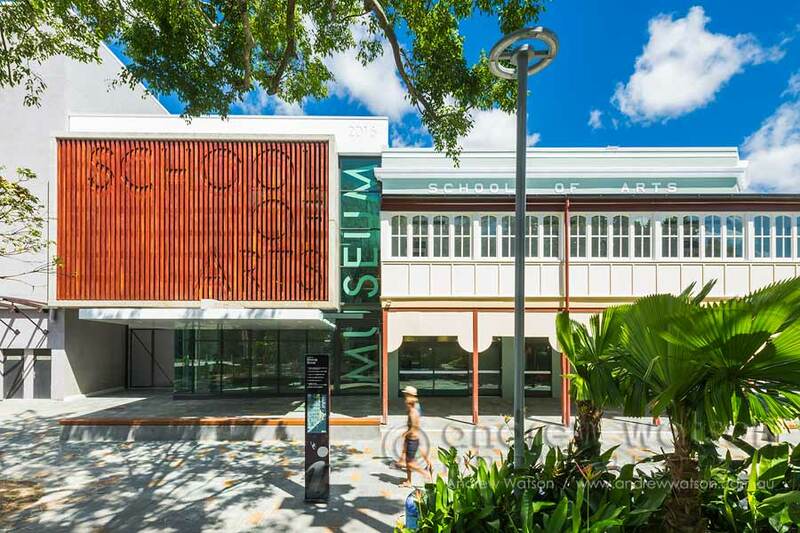 Sitting on the corners of Lake & Shields Streets is the city’s oldest public building – the Cairns School of Arts. From it’s earliest beginnings in 1907 as a centre for Adult Education (similar to a modern day TAFE) the historic building has seen a number of extensions and different uses over the years, including as a public library, and most recently housing the Cairns Museum. I was privileged to do the architectural photography for Total Project Group Architects, who through their innovative design, have ensured a beautiful building refurbishment. Original elements of the building have been preserved and protected, including the original timber flooring and verandah, whilst the facades of the different era buildings (which make up the SOA property) have been restored to their original roots – from early 20th-century design to Art Deco style. A new extension on the Shields Street side, provides two full floors plus a mezzanine level to be utilized by the Cairns Historical Society, as the new Cairns Museum. The facade of the new extension is unashamedly contemporary, inside, this extension interfaces wonderfully with the original structure. This entry was posted in Architecture & Interiors and tagged Architectural photograper, Architecture, Architecture photographer, Building, Cairns, Exterior, Freelance, Heritage building, Interior, Interiors, North Queensland, Professional photography, Property, Queensland, School of Arts. Bookmark the permalink.